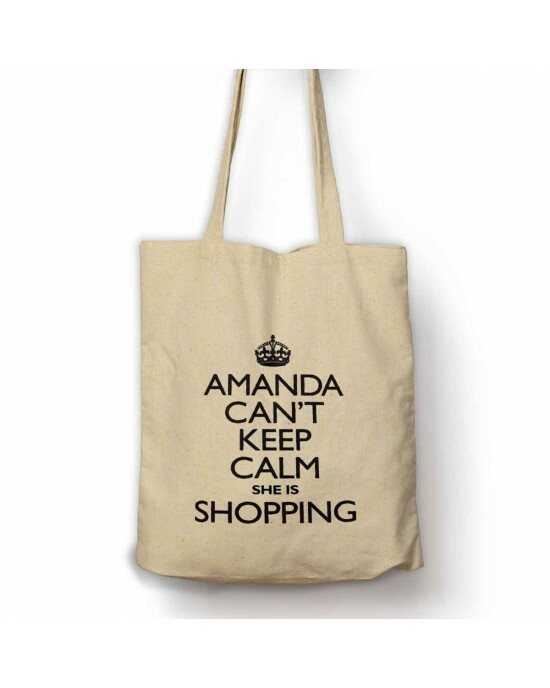 Personalised I Can't Keep calm I Am shopping bag with the typical layout personalised with your name. These personalised wedding tote bags are a great gift for your wedding party: bridesmaids, flower girls, mother of the bride can be personalised for any guest. Fill these pretty personalised bags with things to do, eat and fun items for your bridal party to create lovely personalised thank you gifts. These bags will be kept for years as mementos by your lovely bridal party. Give them out at your hen party, on the morning of your big day, or as wedding table favours, pretty and practical. The bags can be personalised on both sides with your words on each side. Large bag 38 x 42 cm with long handles. Medium bag 26 x 32 cm with gusset and short handles. Washing is possible on a cold hand wash, due to the inherent natural loom state of the cotton, there has been no pre-shrinking treatment applied. The bag is 100% natural, has not undergone any dying or processing so will shrink if washed. Premium Cotton ApronThe Apron Will come with the design shown above, Black apron with white text.The Aprons have ties at the back and a.. Premium Aprons.The product shown in the picture above will be the product you will receive, with the variations you chose at the time of order.. Adult Coloured Apron's.The product shown in the picture above will be the product you will receive, with the variations you choose at the time o..